“Celebrating 10 years of Resource Recovery” is the theme for Carpet Recycling UK’s 2018 Annual Conference and Awards Event which opens at Edgbaston Cricket Ground, Birmingham on Thursday July 5th. The industry-backed association for recycling and reusing waste carpet will be marking a decade of achievements and significant contributions by members – both individuals and organisations – who have all helped to drive greater sustainability in the flooring sector since 2008. The one-day conference, sponsored by Invista, manufacturers of Antron Carpet Fibres will include the annual awards ceremony, which is open for entries now. Rewarding members’ environmental sustainability, innovation and success, the four categories are Recycler of the Year; Reuse Member of the Year; Take Back Partner of the Year and Recycling Champion. Offering valuable networking opportunities, CRUK’s conference attracts decision-makers from across the carpet supply chain including manufacturers, recyclers, waste management companies and retailers. It is also of interest to equipment suppliers and local authorities. 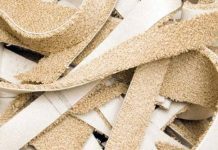 Two international keynote speakers will be spearheading a packed programme that showcases the latest news on carpet recycling practice in the UK, US and Europe. Bob Peoples, Executive Director of the US-based Carpet America Recovery Effort (CARE) will highlight their latest developments in developing market-based solutions for the recycling and reuse of waste carpet. CRUK was founded in 2008 to tackle the 400,000 tonnes of waste carpet arising in the UK annually. Its core funders are Cormar Carpets, Lifestyle Floors/Headlam, Brintons Carpets, DESSO, ege, Milliken, and Balsan. In 2017, 168,000 tonnes of carpet were reused, recycled or recovered for energy. 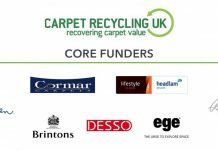 Carpet Recycling UK welcomes enquiries from all types of organisations interested in finding new outlets for their waste carpet with potential savings on disposal costs. To register for the conference or for more information, please call Marie Rhodes on 0161 440 8325 or email: marie@carpetrecyclinguk.com or visit www.carpetrecyclinguk.com.